More than 70 great white sharks have been tagged by scientists who will monitor when, where and for how long the predators linger near Perth’s beaches. In a world first, great white sharks will be monitored over the summer when they move to within 500m of metropolitan beaches from Ocean Reef to Garden and Rottnest Islands where satellite receivers are installed. Surf-life saving groups, scientists and wildlife officials will be notified immediately a tagged shark moves near any one of 18 bright-yellow acoustic seabed devices. Since the receivers were installed in May and December, Department of Fisheries’ senior research scientist Dr Rory McAuley said sharks had been picked up in Perth waters on four occasions. The last detection was in September. “The use of the technology that delivers real-time notifications of tag detections hasn’t been used in an operational sense anywhere else in the world,” Dr McAuley said. In all, researchers hope to tag 100 sharks over the next two years as part of a $400,000 government-funded project. The sharks are fitted with the satellite-tracking darts by researchers who shoot or stab the devices into the flank of the animals. So far, 74 white sharks have been tagged. Of these animals, 67 were from South Australia and seven were in tagged WA waters. “It’s not a complete blanket. We have put the receivers out the front of surf life saving clubs because that’s where, if we are able to implement a response, that is where it is most likely to happen,” Mr McAuley said. 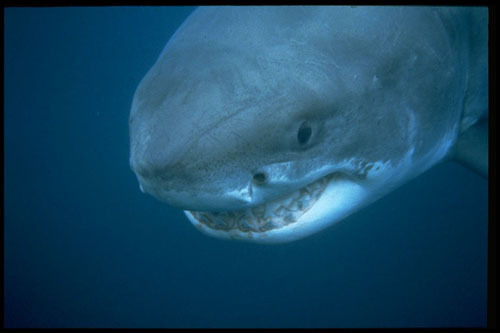 Great white sharks are vulnerable to extinction and are a protected species. A total of six people have been killed by sharks in WA in the past 20 years.